Inkaterra Amazonica is an Eco Retreat in the Rainforest With its Own Private Tree House! 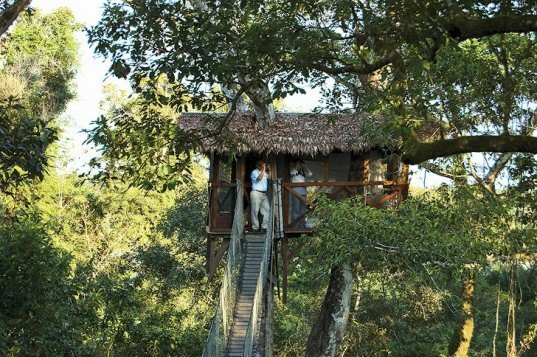 Inkaterra Amazonica is an Eco Retreat in the Rainforest With its Own Private Treehouse! Set within the vibrant biodiversity capital of Peru, the Inkaterra Reserva Amazonica is a gorgeous rainforest lodge complete with its own tree house! Deep in a remote private ecological reserve, the eco retreat offers guests an off the grid escape into the magic of the rainforest. One of the oldest running sustainable eco resorts in the country, the Amazonica offers guests thatched roof villas and a Canopy treehouse escape. Stretching almost 30,000 acres, the Inkaterra Reserva Amazonica is at the heart of an expansive ecological reserve in the Southern Peruvian rainforest. Set along the Madre de Dios River, thirty-five picturesque thatched-roof cabanas give guests a rustic but comfortable stay. Boardwalks made from fallen tree trunks connect the cabanas to the gorgeous lantern-lit main building and dining room, while lounges and balconies are available to watch the colorful tropical birds, monkeys and other animals in the area. Guests of the lodge also have a unique stomping ground to explore the rainforest – up in the trees! An elevated canopy walkway connects a path of trees, the wood and rope suspension bridges connecting tree-top observation rooms built high above the rainforest floor. Two lucky guests can spend the night in the Canopy Treehouse. Complete with two twin beds, the structure has three sides of screened in walls, giving guests a truly unique experience of sleeping amongst the branches, and creatures, of the rainforest. Surrounded by incredible trails, rivers, local plants and native animals, the Ikaterra Reserva Amazonica offers an incomparable rainforest experience. Stretching almost 30,000 acres, the Inkaterra Reserva Amazonica is at the heart of the expansive ecological reserve in the Southern Peruvian Rainforest. Set along the Madre de Dios River, thirty-five picturesque thatched-roof cabanas give guests a rustic but comfortable stay. 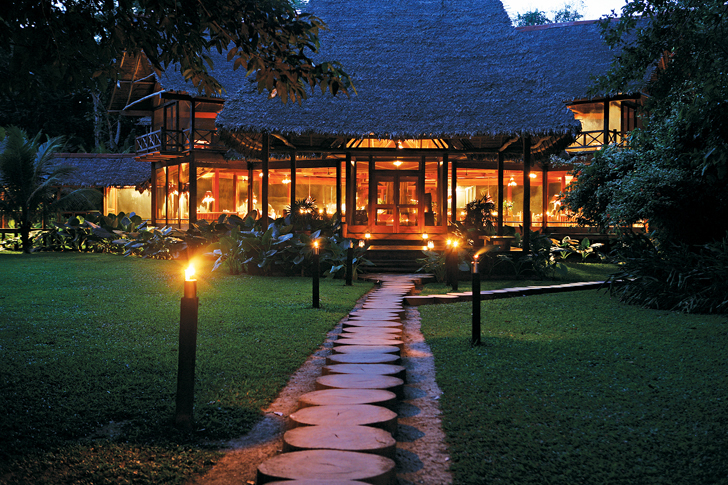 Boardwalks made from fallen tree trunks connect the cabanas to the gorgeous lantern-lit main building and dining room. Lounges and balconies give guests places to perch themselves to watch the colorful tropical birds, monkeys and other animals in the area. Two lucky guests can spend the night with the tree tops, in the Canopy Treehouse. Complete with two twin beds, the structure has three sides of screened in walls, giving guests a truly unique experience of sleeping amongst the branches- and creatures- of the rainforest. Surrounded by incredible trails, rivers, local plants and native animals, the Ikaterra Reserva Amazonica connects its visitors to the untouched and incomparable beauty of the rainforest.